1 Do You Even Need a Watering Can? 1.1 When is a Watering Can Useful? A watering can (also known as a watering pot) is an easy way to water plants by hand and usually comes with a spout and a handle. Most watering cans hold between 1-2.5 gallons of water and are made from plastic, ceramic, or metal. Watering cans have been used since the 17th century (or earlier) and since then have seen countless design improvements. Back then, the metal watering can (or galvanized watering can) was the most common style used. Today, those are typically used for decoration or as a throwback to older times. A quality watering can should have a cap at the end, with small holes intended to break the water stream up into droplets. This will keep the water pressure from building too high, evenly dispersing water onto the plants. Many gardeners prefer a plastic watering can over watering tins for reasons we will cover later on in the article. Below are the best watering cans available on the market, which will also be covered in more detail later on. Do You Even Need a Watering Can? The first logical question to ask yourself when you’re considering purchasing a watering can is whether you even need one. Water cans are not a necessity for everyone. If you own a house or a community garden plot, you likely already have access to a hose and won’t need one. If you are growing flowers, fruits, or vegetables in mass, you likely already have a system for irrigation. For apartment-dwellers, a kettle or measuring cup is probably enough. However, a plant watering can still has use in most places. When is a Watering Can Useful? When you are transplanting or seeding outside, a quality watering can will provide the right volume of water and gentle spray necessary for reaching deep roots. Hoses are harsh on seedlings and aren’t long enough to reach certain areas. Sprinklers may leave certain areas in the yard dry while over-soaking others. Using an ordinary cup may work for lower plants, but for higher-hanging pots, it isn’t sufficient. All of these frustrations can be assuaged with a DIY, long spout watering can. In order to choose the best watering can, it’s important to understand the key differences between each type. 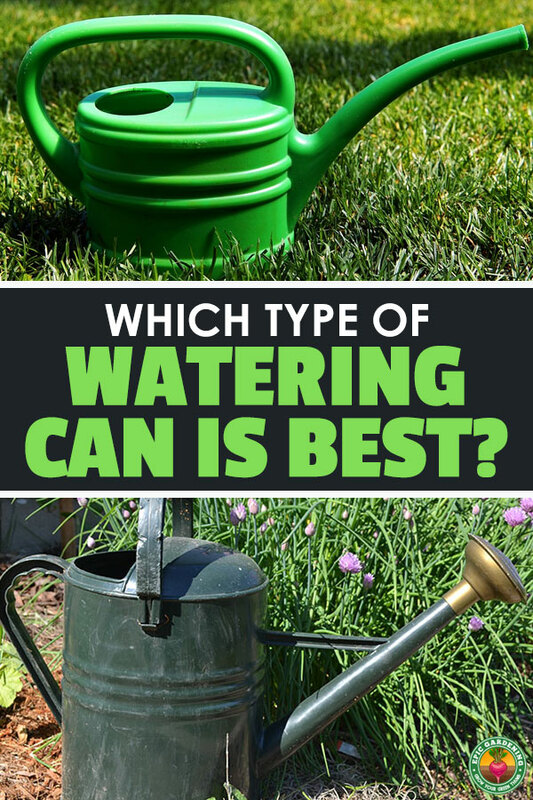 Some prefer the look of galvanized watering cans or tin water cans, but there’s a type that is more popular. The first and most commonly seen type is the plastic watering can. Since the ideal choice is both functional and visually appealing, you shouldn’t have to sacrifice visual appeal for usability. Sturdiness, consistency, and versatility are key and plastic provides all of this. Long-lasting: In terms of physical materials, plastic is ideal since it won’t rust and lasts a long time when properly stored. Efficient with Space: Home and urban gardeners don’t have a lot of storage to work with, so ideally they can find a small plastic watering can. Light and Easy to Refill: A consistent, light flow of water is crucial for plant growth and plastic offers a convenient way to refill without hassle or heaviness. As long as the plastic is safe for gardening (which it should be), you shouldn’t have any issues using a plastic watering can. You’ll just want to keep it out of direct light when not in use to prolong its lifespan. 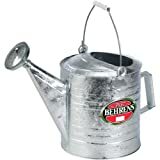 As stated before, metal watering cans were more popularly used in history and are most commonly used decoratively today. Tin watering cans weren’t excluded from this list, even though plastic options are less likely to lead or degrade over time. 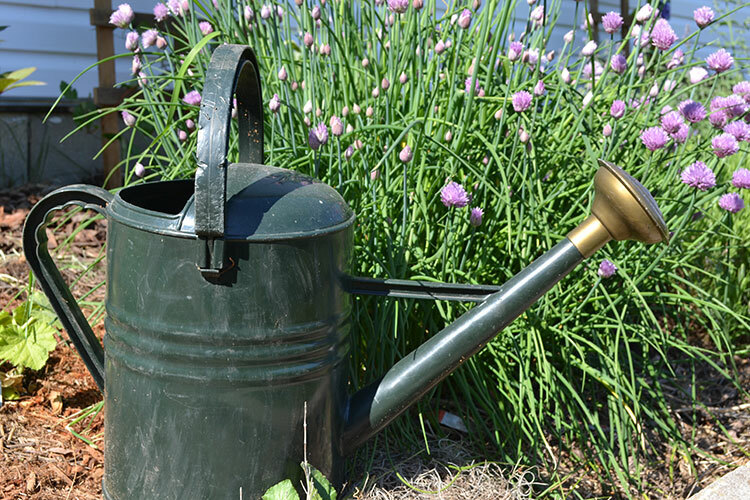 A Simpler Method: Both plastic and metal are suitable materials for a quality gardening watering can and can work for multiple types of plants. Whether plastic or metal, a watering pail is a charming tool that can put us back in touch with simpler times. Galvanized Steel: A galvanized water can with a silver finish is most commonly used for outdoors. It’s durable and has a charming vintage look that looks great in the garden. The benefit of this style is that it doesn’t rust from rain the way other tin watering cans will, but alkaline soil may rust it. When it comes to outdoor watering, galvanized steel definitely wins over plastic. Other Options: There are also brass watering cans, stainless steel, and copper styles. Tin options are typically painted to look decorative and some are even used as flower pots. When it comes to watering indoors, reach and design are what you should consider first. A long reach plant watering can will help you reach high-hanging plants, and an appealing design will look great in your home and make you want to pick up the can and use it. If you have hanging pots in your home and are wanting a watering can for indoor use, long spout watering cans are your best bet. Whether you need to spray your outdoor flowers with a light mist or give your indoor plants some water every so often, misting your plants will increase their levels of humidity. Since plants soak in nutrients and water through their root system, misting won’t add to that, but it will slow down water-loss through the blossoms and leaves. Choosing whether to gently water from below or to mist from the leaves will require that you look at the advantages of both options. Haws watering cans are crafted from recyclable, high grade plastic for rigidity and wall strength. It comes with a right-angle downspout and removable, oval brass, plastic-backed watering rose for better precision with your watering. Effortless Watering and Balance: This watering can comes with two handles for added balance and easy watering. The high neck design of the product prevents water from pouring out of the top when you tip the water can forward. Versatility: You can tip the water can’s rose up to get a gentle spray or down to get a thicker flow of water. To get the water really flowing, you need to tip the water can a lot.This allows you to go between a sprinkle and a dribble without much adjustment other than the pouring angle. The design of the can gives you a lot of choices for how to hold the can to get the flow you desire. Holding Capacity: This Haws indoor watering can is made from high-quality plastic material and can hold a lot of water. This makes it so you don’t have to refill the container in between watering your plants or flowers. Downspout Adaptor may Crack: The downspout adapter on this product may crack soon after purchase. If you need something for inside, this choice will work, but for outside needs, consider the Haws Practican Outdoor Plastic Watering Can. For those seeking a more vintage style, consider the Haws Traditional Peter Rabbit Metal Watering Can. If you’re seeking an indoor watering can, the Bloem Aqua Rite Watering Can is a great choice. This small option is functional, cute, and fairly-priced. Let’s look at some of its other features. Thin Spout: The thin spout on this watering can allows for easy viewing of the water level in the can. This way, you can see when it needs to be refilled. Great for Indoor Use: This container works well for indoor plants because you can position it to only hit the roots instead of spreading the water over the flowers and leaves. A Spill-free Design: This small watering can has a spout that is curved and positioned to prevent spilling water between the plants and the tap. Support: This product is designed for comfort and support. While pouring, you can slip your hand into the handle without worrying about dropping it. 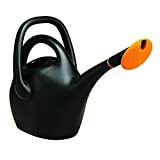 Very Small: Some may find the size of this watering can inconvenient and it’s best for those with small plants to maintain. Holds 2.6 gallons = 333 oz. Rotating Spout: You can choose between a steady stream or a gentle shower with the adjustable, rotating spout on this watering can. Holding Capacity: This watering can holds over two gallons of water which is useful when you have a lot of plants to water. It has dual handles to accommodate various hand positions for your comfort. Sturdy Material: This is crafted from sturdy plastic and will last a long time. The hole for filling is on the container’s sides, meaning that the handles won’t obstruct the process. Slipping Handle: The double handle on this watering can may slip out of place easily. Take this into consideration if you buy this model. Hard to get a Light Water Flow: Some may find the nozzle hard to maneuver. The product doesn’t’ always product an even or steady water flow. Watering plants indoors calls for different circumstances than outdoor watering. The best option is to research your needs and make choices accordingly. This high-quality can has a classic, vintage look, is made from recyclable materials, and won’t rust from adverse weather conditions. In addition, it holds a lot of water, which is unique for a small metal watering can. Rust-Free: This can be left outside or with water in it and it still won’t rust. The container is crafted from durable materials and will last much longer than most tin watering cans. A Wide Spray Pattern: The Behrens 210 2.5 Gallon Steel Watering Can has a wide sprinkle pattern that allows you to send the water far. To get a full blast of water, just tip the can forward. You can also control the spray pattern by not tipping it forward as much. A non-removable Sprinkle Head: This product’s sprinkle head doesn’t come off. So if you wanted one that comes off, keep that in mind. This won’t be a problem for most gardeners, however. The Haws 10-Ounce Brass Mister increases the humidity around flowers and plants to help them stay healthy, keeping them free from dust. It’s made entirely of brass and is the ideal size for use indoors. Gorgeous Design: This shiny mister will look great whether you’re using it or not. When you aren’t using it, it makes a fine centerpiece for your living room. The product sprays a nice, fine mist over your flowers and plants. Sturdy and Durable: Due to its brass construction, the Haws 10-Ounce Brass Mister is durable and sturdy. You can expect to own it for a long time and it will stay shiny and attractive. Small Holding Capacity: The product is smaller than some may expect and only holds 10 ounces. Depending on how large your garden is, this is something worth considering before you make a purchase. The Bosmere Haws Long Reach Watering Can is the clear winner out of all of the cans on the list, due to its durable materials and large holding capacity. It’ll let you keep your plants nice and hydrated, last a long time, and will last throughout the years, making the investment well worth the price. 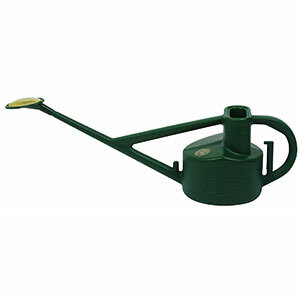 Is the plastic dark green 2-handle watering can with the gold spout available for purchase anywhere? I’m trying to replace one of these cans that I owned. The only one I can see that is somewhat close to that one is this Bob: https://amzn.to/2u29UWR kind of an antique feel and couple probably paint it green. Hope that helps! my violets won’t flower! Help!